My dad got me the yogurt maker I talked about in my birthday wish list post. I tried it out the other day and it works quite well. I like the fact that it has plastic cups, which reduces the fear of breakage from small children playing in the fridge. I thought it a little weird because it has 8 cups that hold 6 ounces each, but if you use a quart of milk that makes them 4 oz. each. But then there's extra room in the cup to stir in jam or whatever. The truth is, a nice little 4 ounce serving of yogurt is usually plenty for me, especially with extra stuff in it. Generally, though, I just like a bit of sugar to take the edge off. I like to use whole milk because it's extra creamy. Yum! My thesis defense is now scheduled for the morning of Thursday, May 10th. I just bought a round-trip ticket to Utah for two days. I'm also already getting extremely nervous and I'm afraid that the next week and a half is going to be filled with visions of myself either wetting my pants or throwing up from terror. Now that would be a good way to make an impression on my committee. This afternoon the kids both boycotted their naps, so by 4 o'clock we were all sitting there feeling tired and cranky while staring outside at the damp cold playground. So what else should I decide to do but bundle them in the car and trot off to the grocery store? Yes, sleep deprivation really does bring on insanity. I had never been to Trader Joe's before, but after hearing enough people rave about it I had been thinking about it for a few weeks now. We did need a few things from a store, and I felt embarrassed dropping S-Boogie off at the usual grocery's fun center with a giant swollen lip. Plus the car ride would buy us more time before bedtime and I had to walk up to the car anyway to get the stroller out of the trunk. I just got my first phone call in response to my resume (I've submitted it to about 20 different places now). Unfortunately the dates they wanted to interview are the two days I'm planning to be in Utah for my thesis defense. The lady sounded kind of disappointed--I hope they like me enough to find a better day for an interview and that they call me back. I hate job hunting. Especially since the thesis defense date is not set in stone just yet. I have a few post ideas rolling around in my head, but decided that I'd go ahead and write up a few of my favorite meatless meal ideas in honor of Earth Day today. I mainly have become mostly meatless due to the fact that meat is expensive, but eating less meat is also a good way to help out the environment. I just set up my new printer/scanner/copy machine. This is the first time I've ever had a scanner, so it's pretty exciting. One of these days I'm going to scan in all my mission photos just so I can write fun posts about them. I'm not sure this file is the highest quality I could get--I need to fiddle around with it some more. But it's still pretty cool. 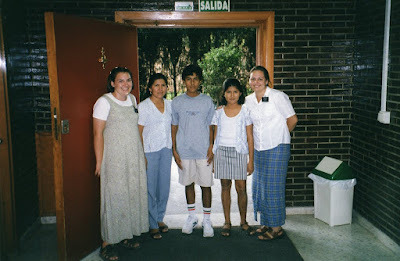 Oh, and that's me and my super cool Spanish companion with the Bolivian family that we taught. The entire family got baptized (I don't know why the dad isn't in the picture) and they are really neat people. I wonder what they're doing now, since I haven't heard from them since I left Madrid. PS--Don't you love my ugly jumper with the stains on it? It's amazing what you'll wear after having no new clothes for nearly a year. The jumper came from our stock of piso clothes--items left behind by departing missionaries that ended up being community property. At least it was comfortable. Today a student walked by me wearing a shirt that said "Don't mess with the crazy person." Either he hasn't been watching the news this week or he's exceptionally rude. Right now I'm still trying to find a job; I'm hoping it will be something I enjoy and that I'll want to work at for a while. Or it may not be--things are still a little uncertain at this point. The thing I am realizing, however, is that I need more than a job, I need a career. Yes, I've been working on a master's degree for three years now and that should be able to help me launch a career. It probably will, but I'm not sure what kind of career I want. If I want to teach I should go on to get a PhD. Otherwise I will be teaching community college for the next twenty or thirty years. I should decide by the end of this summer, because the application process can be somewhat involved and difficult and most applications are due in December or early January. This post over at Times and Seasons led me to a whole new way to waste time: watching video of people opening their mission calls on You Tube. It is, of course, inevitable that people would start using this medium for broadcasting their life milestones, and getting your call really is a milestone. Most people probably only put their video up for friends and family, but it's still fun to watch even if you don't know them. My favorite is this one of two guys from Finland. It's probably not as funny if you speak Finnish, but it made me bust a gut watching them. I've been wanting to start this book review thing since the beginning of the year, but I keep forgetting about it. This is mainly so that I remember what I've been reading, since it all tends to blend together into mush in my brain. But I also love to share books with others so I thought it would be fun to let everyone know what's been on my mind lately. This was the perfect book for a road trip: light, humorous, and broken down into small-ish sections. It was also laugh-out-loud hilarious in several spots. Even though he is crude at times and sometimes the hyperbole bothers me, when I'm in the right mood David Sedaris will literally cause me to hyperventilate with glee. SB: Look Mommy, it's getting dark. Soon the sun will eat his dinner, put on his pajamas, and brush his teeth and go to bed. Me: What does the sun eat for dinner? SB: Hmmm... Sun macaroni and cheese! I have been away from home for over three weeks now and I'm anxious to get settled down somewhere. My original plan had been to stay in Utah for a little while and then go back up to Seattle if it didn't feel right or things weren't working out. Then when I got here I decided to just stay and look for jobs. Now I've changed my mind again and I'm going back up to Seattle. I feel like this is the right decision. I've prayed, pondered, received a priesthood blessing, and gone to the temple. And I watched all four sessions of conference and really listened to the Spirit speaking to me rather than the speakers. After studying it out in my mind I realized the following things: I like the climate and the culture of the Northwest, the job market is better for the kinds of careers I want, and my children will be closer to their father. I will be farther away from family and some of my friends, but I'm trusting my mind and my heart on this one. I feel like I haven't been posting much lately. It's not just because I'm on vacation. For the last month everything has been really crazy in my life. The problem is, we're getting divorced. I haven't said much on the blog yet, but it's getting to the point where I can't really post much that would make sense without some background. And I'm tired of pretending like everything is fine when it's not. I'll try not to turn this into a forum to vent my feelings; that's why I have a journal. Most of my close friends and family already know, but like I said, I need to be able to post again.